The Department of Homeland Security has already used information from the work to try to convict smuggling kingpins. DNA fingerprinting has helped conservationists and law enforcement teams identify three major cartels that dominate the elephant ivory-smuggling market, researchers said Wednesday. Samples taken from seized elephant tusks link multiple shipments to cartels operating out of Africa, the team reported. The information they have gathered is already being used to solidify cases against smuggling kingpins, a Homeland Security official said. Samuel Wasser, director of the University of Washington Center for Conservation Biology, and colleagues developed the new DNA fingerprinting approach after making a map of elephant DNA and then getting samples from 38 large seizures of tusks. “We identified three major export cartels operating in Africa between 2011 and 2014,” Wasser and colleagues wrote in their report, published in the journal Science Advances. Samples from tusks seized around the world were matched to trace them back to three big crime networks. Ivory smugglers buy tusks from individual poachers across Africa. The poachers are small-time operators and hard to track down, but the cartels consolidate and ship the tusks around the world in big shipping containers. Often, individual tusks get separated and shipped in different containers, which are difficult to trace back to the originators. Wasser’s team used DNA sequencing to match up pairs of tusks that got separated before they were shipped. “By linking these matching seizures together like links in a chain, we were able to identify what we believe to be the three largest cartels moving ivory during this peak 2011, 2014 period,” Wasser told reporters on a conference call. "There is so much information in an ivory seizure — so much more than what a traditional investigation can uncover," Wasser said. "Not only can we identify the geographic origins of the poached elephants and the number of populations represented in a seizure, but we can use the same genetic tools to link different seizures to the same underlying criminal network." They already provided information to convict one major smuggler. “Substantial evidence suggests that the largest of these cartels was tied to a man named Feisal Mohamed Ali, who is perhaps the most notorious ivory trafficker in Africa. The links we described aided in Feisal's conviction in Mombasa nearly two years ago when he received a 20-year prison sentence,” Wasser said. Now they hope that the additional evidence they’ve uncovered will help put Feisal back in jail. "Most ivory traffickers facing prosecution are charged for a single seizure," the team wrote. "Methods that can connect individual traffickers to multiple large seizures have the potential to elevate their charges to major transnational crimes, simultaneously increasing the severity of their sentences." The researchers also hope that their evidence can stop much of the poaching altogether by cutting off the cash that supports it. “It costs about $25 for a bullet to kill an elephant and these poachers don’t have a lot of money, so someone needs to be supporting them,” Wasser said. 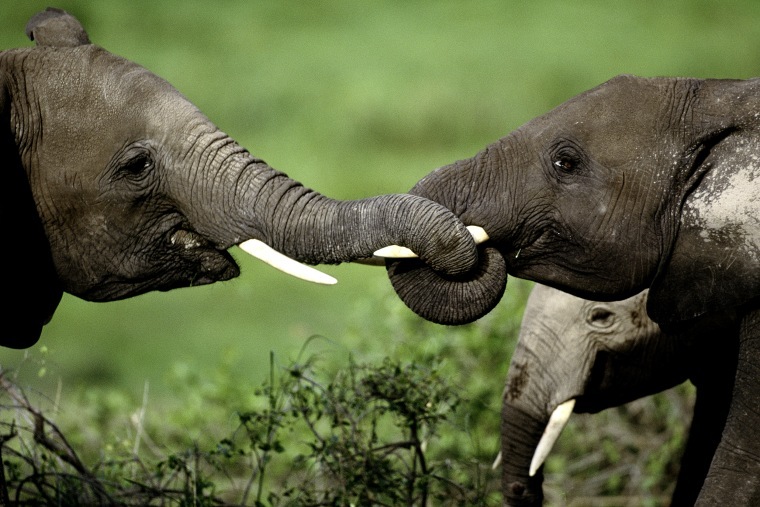 Poaching is helping endanger the African elephant population. “Right now we’re estimating that there are about 40,000 elephants being killed a year and there’s only 400,000 left in Africa so that’s one-tenth of the population a year,” Wasser said. The ivory is sold to make art and jewelry. An international agreement called the Convention on International Trade in Endangered Species of Wild Flora and Fauna, or CITES, has banned commercial trade in African elephant ivory since 1989 — a ban the U.S. Fish and Wildlife Service has enforced since 2016. But CITES allows sales under certain circumstances, and the U.S. is among the largest markets for illegal ivory. “By providing the DNA analysis for major ivory seizures across the globe, Dr. Wasser's lab has provided hard evidence used by Homeland Security Investigations and its host country and NGO (non-governmental organization) counterparts to identify, dismantle and disrupt the transnational criminal organizations behind the illicit trade in wildlife,” said John Brown, a Department of Homeland Security special agent in Nairobi, Kenya. Brown said the information has helped gain the cooperation of governments that had not taken any previous interest in prosecuting the smugglers. “We have countries talking to each other on this topic and combating illicit trade and wildlife that otherwise wouldn’t have even picked up the phone,” Brown told reporters on the call. Plus, it’s helping take down violent criminal gangs who also have links to the narcotics trade and to extremist groups such as ISIS, Brown and Wasser said. “They are outfitting the poachers. They are buying guns. They are buying bullets,” Brown said. Wasser said thousands of rangers had been killed while fighting wildlife traffickers. “These are dangerous people, no question about it,” he said.